The excellent material characteristics of softshell outdoor clothing have made it a must-have for mountain and outdoor sports . Softshell jackets and trousers have become increasingly popular for everyday and outdoor use, because the elastic fabric can be used for a wide variety of purposes. The robust material combines a multitude of positive characteristics. Softshell jackets, trousers, bodywarmers, and gloves feel like a second skin, because the fabric is super soft, relatively light-weight, and reliably protects against wind, water, and cold. On Alpine tours or on hikes, for climbing on rock walls or trail running - there is hardly a sport today that doesn't utilize the amazing properties of softshell. Softshell is used in a large variety of outdoor textiles, including jackets, bodywarmers, trousers, beanies, and gloves. The fabric comes in varying thicknesses depending on the purpose of the garment, with some selected models adding a supplementary membrane. There are, for example, softshell jackets with an integrated membrane for effective protection against wind and cold, like the Gore Windstopper. Windstoppers have basically become synonymous for softshell jackets. Individual manufacturers add waterproof membranes, like NeoShell and other proprietary developments to make the softshell fabric impervious to storm and rain. Softshell is therefore the perfect material for warm summer nights, cold and wet autumn days, and winter temperatures alike. All softshell jackets protect the body reliably against freezing winds, and generally give adverse weather conditions no chance to affect your enjoyment. The excellent insulation properties of softshell jackets keep your body heat where you need it on cold days. The highly functional fabric is also breathable, which means your body temperature won't change even when you exert yourself on mountain, ski, or hiking tours. Softshell jackets offer superb breathability, which optimizes your body temperature at all times. Moisture is wicked away from your skin, and transported outward with excessive body heat. This leaves your torso comfortably dry, which means you will feel less cold. 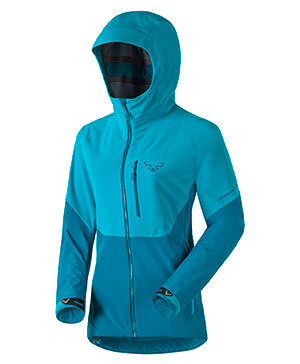 The only drawback of softshell in comparison to hardshell is its lacking rain protection. The great advantage of softshell is is its excellent flexibility and extreme hard-wearing constitution. Where hardshell jackets become an encumbrance, a softshell jacket will literally stretch your capacity a little further. The stretch weave and use of elasthane make these softshell textiles particularly elastic. This extra flexibility comes in very handy on climbing tours, as you will need every bit of freedom of movement you can possibly get. The sturdiness of the fabric is comes as an extra plus when pitting it against solid rock. Even sharp edges and direct contact with rough surfaces won't faze your softshell jacket. Extreme stresses are exactly what this material was designed for. 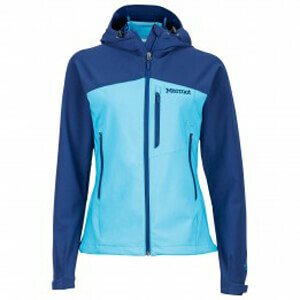 All in all: softshell jackets are the perfect companion for any kind of mountain sports.